Anne Currie talks about the architectural impact of containers, and what modern container schedulers mean for resilience, redundancy and server density. Peter Bourgon and Matthias Radestock explain the theory behind Weave Mesh, some of the important key features, and demonstrate some exciting use cases, like distributed caching and state replication. 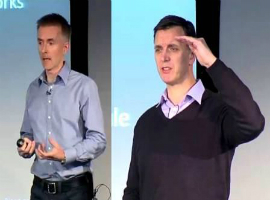 Ian Dugmore and Jonathan Smart tell the story of Agile transformation across Barclays, what they have done and how they’ve done it, and the challenges bringing about culture change. Gerard Sans explains RxJS' data architecture based on reactive programming, exploring Observables API using RxJS koans and unit tests. RxJS 5 focuses on performance and usability. Kriti Sharma talks about how Barclays is solving some of the toughest big data challenges in financial services using scalable, open source technology. Dan North discusses a number of feedback models and techniques, where and how to apply them, explaining the sandwich feedback model, how it works and why it usually doesn’t. Benjamin Wootton discusses doing DevOps in banking and financial institutions, providing advice on performing a DevOps transformation in such an environment. Ryan Huber talks about some of the ways Slack approaches collecting, inspecting, and communicating security information to the security team and to the individuals in their organization. Zane Lackey discusses adapting security to change, building security programs, lessons learned from bug bounty programs, running attack simulations and knowing when security has been breached. John Willis breaks down what is known about Burnout. Willis takes a look at some survey data and tries to suggest ways to achieve healthier outcomes for ourselves and our colleagues. Olaf Carlson-Wee explores micropayment and wealth storage use cases for bitcoin and examines cryptosystems used to facilitate micro-penny payments and secure $B in global bitcoin banks.